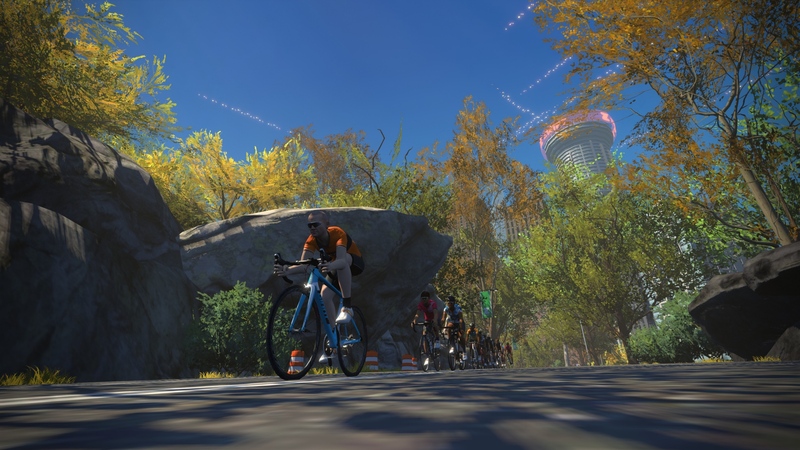 New York’s Central Park has arrived on Zwift, the popular on-line training/gaming platform. This new course is a reimagined urban oasis, set in the world of tomorrow. Zwifters at all levels can explore the routes and climb high above the park. With no red lights, cars, or parents pushing strollers to slow you down, the Park is your new place to train. To fully assess the size and scale of the urban park, the Zwift art team flew to New York City for a recon mission. Using GPS equipment and 360° cameras, they captured the exact dimensions and marked iconic landmarks to feature in-game. Do a loop and you’ll find inspired recreations of the Metropolitan Museum of Art, Guggenheim Museum, Empire State Building, Tavern on the Green, Belvedere Castle, and more. your training experience because if you enjoy your training, you train harder. It’s that simple. So what’s different about Zwift’s Central Park? A whole lot. Ride or run in both directions, instead of just one. A new climb puts you on roads that float high above the ground, and into the future. Scattered throughout the landscape are modernized touches. Robot horse-drawn carriages, cars that need neither gas nor road, and more surprises. Nowhere is this more apparent than on the climb. Make your way to the summit and catch the views as you head back down. The 6 Train: Distance: 4.0mi // 6.5km. Elevation: 226ft // 69m. The shortest route around the park. Flat, fast, and fun. Named for the most direct subway route between Grand Central Station and Central Park. The High Line: Distance: 6.5mi // 10.5km. Elevation: 587ft // 179m. A nod to the landscaped High Line Park, this “ride in the skies” route sticks to the elevated roads, and loops at the KOM arch. Astoria Line 8: Distance: 7.2mi// 11.5km. Elevation: 465ft // 142m. Named for the first NYC subway line, this figure 8 path loops around the park. LaGuardia Loop: Distance: 1.7mi // 6.5km. Elevation: 89ft // 27m. Quick and fast lap for special events only. Named for famed NYC mayor Fiorello LaGuardia. Everything Bagel: Distance: 21.3mi // 34.3km. Elevation: 1789ft // 545m. A delicious route with all your favorite toppings. Hit the Sprint and KOM in both directions on this long, looping route. Grand Central Circuit: Distance: 4.2mi // 6.8km. Elevation: 472ft // 144m. A circuit course that takes the steep route up and down the KOM with a short loop around the Sprint in between. Unlike the trains that run through Grand Central Station, these roads go magically up. Knickerbocker: Distance: 13.9mi // 22.4km. Elevation: 1197ft // 365m. This mostly flat route has some grit and kick to it, with one trip up the KOM via the steep route. Lady Liberty: Distance: 7.7mi // 12.3km. Elevation: 674ft // 206m. A steep climb that winds up to the KOM just like the famous Statue’s torch, followed by a long lap around the park. Mighty Metropolitan: Distance: 12.5mi // 20.0km. Elevation: 1045 ft // 318m. Make massive moves over meadows and most of the park in this meandering mega loop. Park Perimeter Loop: Distance: 6.1mi // 9.7km. Elevation: 413ft ft // 126m. Tour the outermost loop of the park on this fun and snappy course. Rising Empire: Distance: 12.9mi // 20.7km. Elevation: 1234ft // 376m. Hit the KOM in both directions on this climber’s course. 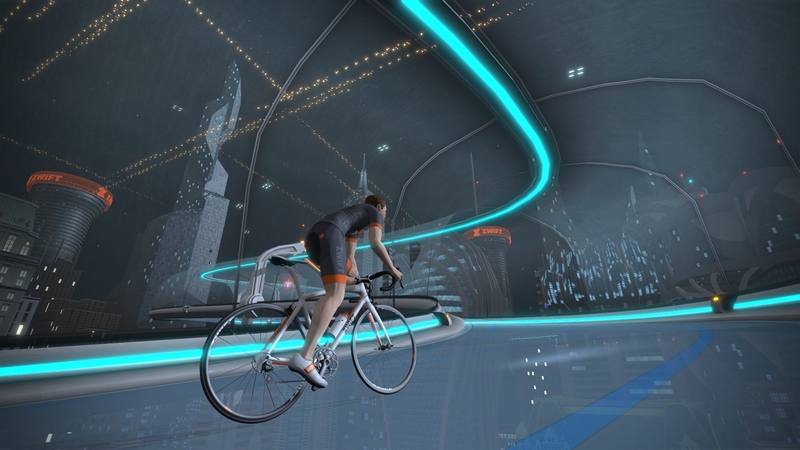 Learn more about the virtial Big Apple at zwift.com.